Battle-watcher was disabled over a year and a half ago. Since then website has lost almost all real users and it was interesting only for bots. Today I decided to completely shut down this project since I don’t really see any sense in hosting this website anymore. 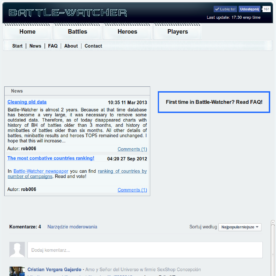 If you’re interested in buying a battle-watcher.com domain, please contact me (with a reasonable offer :)). Changing hosting has opened a new opportunities, among other things it became possible to use my own SSL certificate for domain. For some time I tested https on site and free certification from StartSSL. IMO tests were quite successful, and the New Year is a good time for a changes. From now https on page is forced and all traffic will be encrypted. From today statistics of battles in Battle-Watcher are not updated. For a long time the service worked only partially, and I did not have time or motivation to fix it. After change of hosting the next things stopped working and I decided that it makes no sense. Service remains in read-only mode, statistics of battles and users will be not updated. I do not plan a further development and improvements, so you can consider that it is the end of the Battle-Watcher.